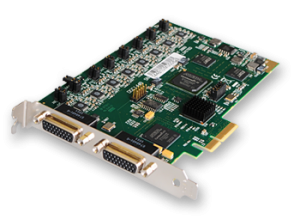 The VisionSD8 is an eight channel PCI Express video capture card. The card supports PAL, NTSC and SECAM in both composite and S-video input formats. VisionSD8 video capture card supports de-interlaced video capture and display at 25 / 30 fps for real time video overlays. The Vision range of video capture cards are fully integrated with the Datapath family of video wall multi-display products. The VisionSD8 captures a composite or S-video output from one source and then displays it as an independent application on your video wall, this is done in real time. The VisionSD8 has a powerful software application to automatically configure the timing and the format of the input source and display the captured data.